Smashed dreams: Three Cooks Cafe's window vandalised for the third time in a month. MP Rachel Maclean and John Campion, the Police and Crime Commissioner for West Mercia, will meet Redditch business owners tomorrow, Saturday, following weeks of vandalism in the town centre. Furious shop owners are fed up with turning up for work after the weekend to discover their windows have been smashed by yobs. 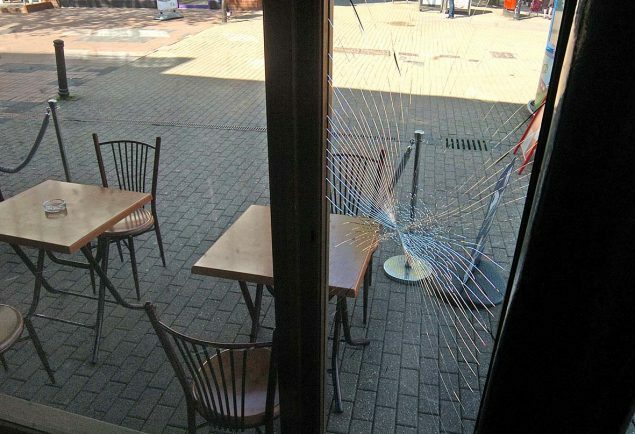 The Redditch Standard reported recently that Three Cooks Cafe on the corner of Evesham Walk and Market Place was one of many businesses to suffer from the vandalism, having had their windows smashed three times in the space of a month. At the time, owner of Three Cooks, Tim Cangaj, said: “It’s so disheartening to come back to work and find my windows smashed again. MP Rachel Maclean said: “After I was made aware about the persistent vandalism in the town centre, I jumped straight on the phone with John (Campion) and asked him to join me in Redditch to meet the business owners. “This vandalism is not acceptable and it has got to stop. “Business owners’ hard work contributes to our town’s economy, yet these cruel and callous vandals show no regard and absolutely no respect. Mrs Maclean and PCC Campion will be speaking to owners in the town centre at 9am on June 16. Buy photos online from the Redditch Standard newspaper.